Born January 28, 1981, Elijah Wood has grown up to be one of the most well respected and steadily employed actors of his generation. Born in Cedar Rapids, IA, Wood modeled and did local commercials before moving with his family to Los Angeles in 1988. It was there that Wood got his first break, a small role in a Paula Abdul video. Film work almost instantly followed, with a bit part in the 1989 Back to the Future II. It was Wood's role as Aidan Quinn's son in Barry Levinson's 1990 Avalon (the third film in the Baltimore trilogy containing Diner  and Tin Men ) that first gave Wood attention, as the film received widespread critical acclaim and was nominated for four Academy Awards. After a small part in the Richard Gere potboiler Internal Affairs (1990), Wood secured his first starring role in Paradise (1991), in which he played a young boy who brings estranged couple Melanie Griffith and Don Johnson back together. He received good reviews for his performance -- some said it was one of the best things about the film -- and from there went on to co-star with Mel Gibson and Jamie Lee Curtis in Forever Young and in Radio Flyer (both 1992). Following a brief turn as the boyfriend of a wannabe hip-hop groupie in James Toback's problematic Black & White (1999), Wood further evolved as an actor in Lord of the Rings: The Fellowship of the Rings, the first installation of director Peter Jackson's adaptation of J.R.R. Tolkien's Lord of the Rings trilogy. His most hotly anticipated project, the 2001 film gave Wood top billing as Frodo Baggins alongside a glittering cast that included Ian McKellen, Cate Blanchett, and Liv Tyler. That same year the young actor could be seen in less mystical surroundings courtesy of Ed Burns' Ash Wednesday, a crime drama that also featured Oliver Platt and Rosario Dawson. In 2002, Wood let his vocal chords for Disney's straight-to-video release of The Adventures of Tom Thumb and Thumbelina. Of course, his most substantial role of 2002 is unarguably his return to the role of hobbit Frodo Baggins in the second installment of Tolkien's Lord of the Rings trilogy; specifically, Lord of the Rings: The Two Towers. 2003 proved to be a similar year for Wood -- after two relatively small jobs (his role credited only as "The Guy" in Spy Kids 3-D: Game Over and his stint as First Assistant Director in Sean Astin's The Long and Short of It served purely as a break for Elijah), the young actor once again resumed his role for The Lord of the Rings: The Return of the King. 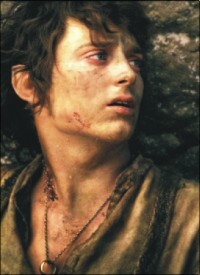 Though Return of the King is the last in the Tolkien trilogy, 2004 nonetheless looks to be a significant year for Wood, as he is slated to star in soccer flick Hooligans, as well work alongside Jim Carrey and Kate Winslet in director Michael Gondry's fantasy feature Eternal Sunshine of the Spotless Mind. Synopsis: The Fellowship's journey is coming to an end. Sauron's forces have attacked Gondor's capital of Minas Tirith in his final siege against mankind. Watched over by a fading steward, the once great kingdom has never been in more desperate need of its king. But will Aragorn find the strength to become what he was born to be and rise to meet his destiny? As Gandalf desperately tries to move the broken forces of Gondor to act, Théoden unites the warriors of Rohan to join in the fight. Even in their courage and passionate loyalty, the forces of men with Éowyn and Merry hidden among them are no match against the swarming legions of enemies raining down on the kingdom. With each victory comes great sacrifice. Despite their great losses, The Fellowship charges forward in the greatest battle of their lifetime, united in their singular goal to give Frodo a chance to complete his quest. Traveling across treacherous enemy lands, Frodo must rely increasingly on Sam and Gollum as The Ring continues to test his allegiance and, ultimately, his soul. Take a moment to breathe a sigh of relief and satisfaction before this movie begins. You're in good hands. And enjoy that breath because it may be your last for the next three hours. One of the most ambitious projects in the history of film-making comes to a heart-poundingly thrilling conclusion in "Return of the King," the last episode in Tolkien's Lord of the Rings trilogy directed by Peter Jackson. The second installment opened in the middle of the action, but this one begins with a flashback. It's not there to repeat anything we've seen before -- there's no time for that. This glimpse of the past is just to tell us something more about Gollum, the twisted, tortured creature who is supposed to be leading Frodo (Elijah Wood) and Samwise Gamgee (Sean Astin) to Mount Doom. It is also there to tell us more about the power of that ring to make anyone willing to give up all he has to possess it. After that very brief prologue, we are back where we left off, a literal cliff-hanger. Frodo, Sam, and Golum are crossing the stark peaks on the way to the volcano in the heart of Mount Doom. That is where the ring was forged and the only place where it can be destroyed. Meanwhile, the other remaining members of the Fellowship of the Ring prepare for battle with the forces led by Sauron. As with the first two chapters, Peter Jackson's rendition of the J.R.R. Tolkien classics is astonishingly inventive and new and yet so clearly right that it seems as though it always existed inside us. Every detail is just right, from the leaf-shaped clasps on the rough wool cloaks to the huge mumakils, mastodon-like creatures carrying Haradim warriors in vast contraptions that look like masted schooners. And from the struggles of three very small creatures to stay alive as they scale sheer rock to the huge battles with hundreds of thousands of warriors, Jackson makes every moment vivid, exciting, and moving, filling every frame with wonders. That means not just Middle earth citadels, a giant spider, a battering ram that is an ironwork boar filled with fire, and thousands of phantom combatants, but also smaller moments of equal power. Sam and Gollum each try to make Frodo mistrust the other. The steward eats alone at his table, bright red juice dripping down his chin, as his son leads men into a doomed battle. There are villains, grotesque and powerrful, weak and greedy. And there are heroes, loyal, brave, devoted, honorable. Told that death is certain and there is small chance of success, one replies, "What are we waiting for?" Who needs to breathe when there is all this to see? The tone is epic and majestic, the battles brilliantly staged, the vistas magnificently conceived. But it is still all about the story. Characters learn and deepen. Even little Pippin and Merry go from cute comic relief to genuine heroes. There is so much going on that some characters feel like not much more than cameo guest appearances, especially Arwen (Liv Tyler) and Galadriel (Cate Blanchette). And the post-ending endings, after more than three hours, may seem a bit too much. But this is still an epic to satisfy the most devoted fans of the books and viewers who are new to Middle Earth. In its own way, it is as thrilling an adventure in story-telling on film as the quest it portrays. The movie has intense battle violence, graphic for a PG-13. Characters are injured and killed. While there is no modern-day profanity, characters use some strong language. A strength of the movie is the way its diverse characters learn to trust each other and work together. Some critics have accused the original books of racism, with dark-skinned, slant-eyed bad guys fighting pale-skinned good guys. But there is no evidence of any such intent, even unconscious, in Tolkien's work or in this movie. SAUCY CHART STAR Christina Aguilera has been named top role model by teenage girls. The Dirrty singer, who is known for her scanty outfits, was named the biggest inspiration by readers of teen magazine Sugar. She pushed rival Britney Spears into fifth place while Beyonce Knowles was runner-up. Readers praised Aguilera for being "strong minded" and "independent". Aguilera, who has a number of body piercings, beat last year's poll winner Pink. Readers listed some of her qualities as being a "role model with breathtaking talent who isn't afraid to be who she is". They said she was "open and truthful" and someone who "speaks about real-life issues and encourages girls to reach their targets in life". Aguilera said of the accolade: "It's an honour, and being in the UK has been a highlight of my year." It's refreshing to play a game like Broken Sword: The Sleeping Dragon. It's not hugely innovative, and it has its share of faults, but its particular blend of features nevertheless gives it a fresh, fun feel.You'll unravel a colorful, witty yarn filled with lovable characters, dramatic encounters, sharp dialogue, and exotic locales. If nothing else, Broken Sword: The Sleeping Dragon wins high points for style, often looking like a slickly directed animated film. Vibrant colors, expressive lead characters, and detailed settings all draw you into the game. After a dark and mysterious prologue, you see series hero George Stobbart soaring in a plane over the lush jungles of the Congo. With a heroic orchestral theme building excitement and well-chosen camera angles adding visual drama, it almost feels like you're sitting in a theater watching the beginning of a film. This Indiana Jones-style scene hits all the right buttons; everything about the game says "high adventure" right from the start. Many adventure games don't make you feel too adventurous, and most adventure games tend not to be adventurous from a design standpoint. Those facts weren't lost on Revolution when designing this latest Broken Sword installment. In addition to boasting a winning style, the game merges a bit of console-like, third-person action gaming with the traditions of PC point-and-click adventures. This creates a more action-packed feel and helps immerse you better than simply moving a character around in front of discrete, static backdrops. You maneuver George, and later his fellow adventurer, Nico Collard, using directional buttons on the keyboard or a gamepad. You can also make the hero run or creep along stealthily. Whenever you near a hotspot that you can examine or an area that you can climb, jump across, or shimmy along, little icons light up to show your available options. You then just press the appropriate key to select your option. When standing near a telephone, for example, you can examine it, listen to any messages on the answering machine, or make a call. When standing near a crate, you can push or pull it and climb up or down from it, all using this simple icon system. The system means that the game's climbing and jumping puzzles are much less stressful than in a true third-person action adventure game since here you don't need to employ lightning reflexes to avoid a fall. You merely press a jump button at a valid location and let the game handle the rest. You get to solve an interesting conspiracy and murder mystery that takes you from the Congo to Paris, Prague, and other exciting locales. A mysterious villain named Susarro is trying to tap into geomantic energy, powerful currents that run through the earth. It seems like he's really onto something because the earth's weather patterns have been going haywire. George, a patent lawyer from Idaho, stumbles onto this plot while trying to meet an inventor in the Congo. Meanwhile, a Parisian hacker has managed to decrypt a mystic manuscript with clues to the energy, but he gets murdered just as the game's other hero, French journalist Nico Collard, is about to meet him for an interview. Suddenly, she finds herself framed for the murder. With a great sense of pacing, the game smoothly switches back and forth between the George and Nico episodes, and eventually the two old adventuring buddies are reunited to fight the evil that threatens the world. As you travel the globe and uncover the plot, you'll enjoy two of Broken Sword's biggest strengths: sharp writing and a cast of memorable characters. The story is filled with funny, dramatic, and even touching moments, not to mention a rogues' gallery of colorful people. In Glastonbury, England, for example, George lands in the middle of a hilarious imbroglio involving a retired British Army colonel with a bad temper and a shotgun, his randy daughter who's run away from home to assert her womanhood, a monumentally pompous hippie who runs a New Age shop, and an Irish BBC TV host with an almost violent passion for poetry. Even if Broken Sword can at times be frustrating to play, it's a joy to behold. The graphics sure aren't cutting edge, but the attention to detail, vibrant colors, and smooth animations give the game its own attractive style. The wonderfully elegant and evocative soundtrack varies from bold fanfares to jaunty comic bits to pensive piano interludes to suit the locales and situations. With the Eid and Winter holidays coming hand in hand, now is the time to spend your well "earned" Eidis or pocket money on the finest pieces of electronic entertainment available. In other words, it's the ideal time to get the best games money can buy. This week I'll feature the top 10 video games released this holiday season for the Sony PlayStation 2. Next week I'll rank the top 10 PC games. NB. The games are ranked in reverse alphabetical order (from Z - A). Most of these are so good it was too hard to rank by rating. Better known as THUG, this game completely revamps the Tony Hawk universe. With completely open - ended totally customisable gameplay, a HUGE career mode, an 80-song playlist, the ability to get off your board and move about and more...this is another essential must-buy title from the Hawkman. This is the fifth edition of the long running Smackdown series. That's enough for it to be a bestseller over here. With over 65 licensed wrestlers, an incredibly fun career mode, location-specific injuries, a new submission system, six man Elimination Chamber matches and more, give this game a Hell Yeah. One huge mountain with three peaks which one can literally snowboard down in half an hour; millions of out of this world trick combos; and mind blowing graphics with over 30 varieties of snow and ice. Minds, Barriers, Bones, Egos, Laws, Gravity: All broken in one game. Snowboarding has reached levels never reached before. The case: Ethereal graphics, mind-boggling gameplay, wonderfully clever puzzles, haunting soundtrack, solid voice acting, intensely fluid swordplay, and an evil treacherous (aren't they always) vizier with a perfectly evil sneer. The verdict: An awesome genre defining game, No.1 contender for Game of the Year and a definite 'must get'. Known as Winning Eleven 7 in Japan, this game (though not so commonly known in the USA and here) has set the benchmarks for footie games everywhere. With immensely life-like (yet intuitive and easy-to-get-into) gameplay, realistic graphics (players animate and act just like they do in real life!) and the life-taking-over Master League mode there's every reason to buy this game! Made by the same geniuses behind NFS Hot Pursuit 2, this is the true embodiment of the movie The Fast and the Furious in video game form. Stunning visuals, brutally fast (and furious) racing, endless options to mod your ride and more... We need more of this!!! A glorious follow-up to the action-riffic game LOTR The Two Towers, this game is bigger in every way possible. Nine playable characters including Gandalf (and three secret ones), huge levels, incredible graphics, killer combos, exclusive movie footage, and a bloody good soundtrack proves that movie-to-game conversions can be sweet. You'll love this one to death. This is the Holy Grail of the LOK series. Finally, with the answers to all the questions asked ever since Raziel had his wings torn off, this is also the first time in this series, that the gameplay doesn't take a backseat to the story. With a robust combat engine, Telekinetic (a.k.a mind) powers, jaw-droppingly detailed graphics and the ability to play as both Kain and Raziel, this game will own your soul. The story itself is worth the price of admission. Melding every single game genre out there seamlessly, Jak II is a multicultural experience that's utterly addictive and insanely fun to play. Its darker themes, twisted (and pretty darn good) storyline, Vice City-like metropolis and gunplay prove that platforming has evolved. Animation-film quality graphics, almost-perfect gameplay, brilliantly directed voice actor and the return of the ever-corny and endearing Daxter make this one of the PS2's finest ever. In an unprecedented move that's sure to please RPG fans everywhere, Square Enix has decided to revisit one of its previous storylines from an earlier Final Fantasy (FFX) and reveal to the word the eventual fate of some of its more popular characters. This time, FFX-2 has upped the ante with an all-new action-oriented battle system, innovative dress sphere job switching, and more open-ended game design. Once combined with some of the best voice acting, visuals and storytelling this year, Final Fantasy X-2 earns its place as an instant classic. I hope these games will keep you crazy people happy until next Eid. I'll be back next week with more stuff. Cyaz. Weird name but has the coolest stuff. There are lots of free software tools on this site to help you build and maintain your site; plus lots of bullets, icons, backgrounds, bars and themed graphic sets to perk it up. It also gives a lot of tips on how to take the best advantage of HTML. It has a section for those just starting to build up their site and shows easy steps to lead they way. Then again, it also has tutorials. What more can a site offer? The name of this site speaks it all. Download whenever you want, what ever you want. It offers the most recent releases and the most popular software. For today we'll be concerned with its Web Developer, Design Tools and Software Developer links. Don't miss out on the HTML editors. This is a site that will at first cause you a lot of swearing, since it's filled with ads from the very first line. But the reason I'm suggesting this is for what you will find on its sides and at the very end. Just open the page, keep your eyes shut until you get to the bottom of it, then open it to find-Walla! The links to your hearts desire! On this site you'll find free trial versions, software development kits, and freebies to lighten up the websites that you're working so hard on. Go to its 'web design products' link and you'll find all you need to create great looking images, menus and GIF animations for your Web pages. Before I end, I would advise newcomers in web development to emphasise on the use of Meta Tags. Using Meta Tags helps you to get your site listed closer to the top of some search lists. They are code in your HTML that is invisible to the guests of your web site but are read by some web spiders and search engines. I'm sure you'll find something on them soon. Hope you guy's have a blast on New Year's Eve. See you all after the Party! Happy New Year!